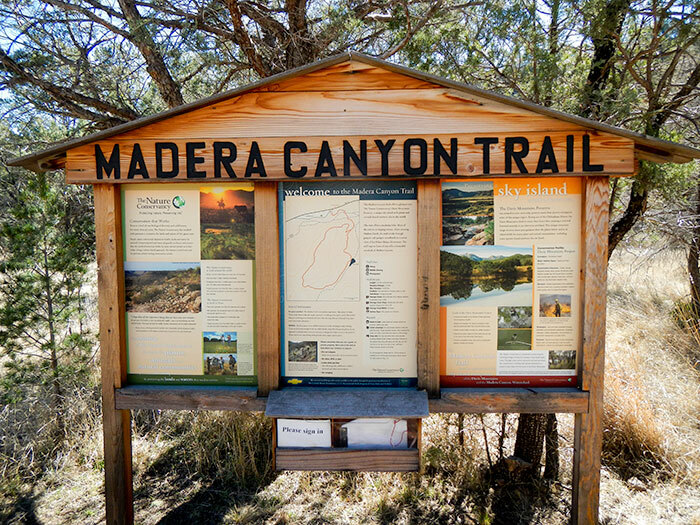 The Madera Canyon Hiking trail is provided to the public, free of charge, by the Nature Conservancy, and not part of Davis Mountains State Park. 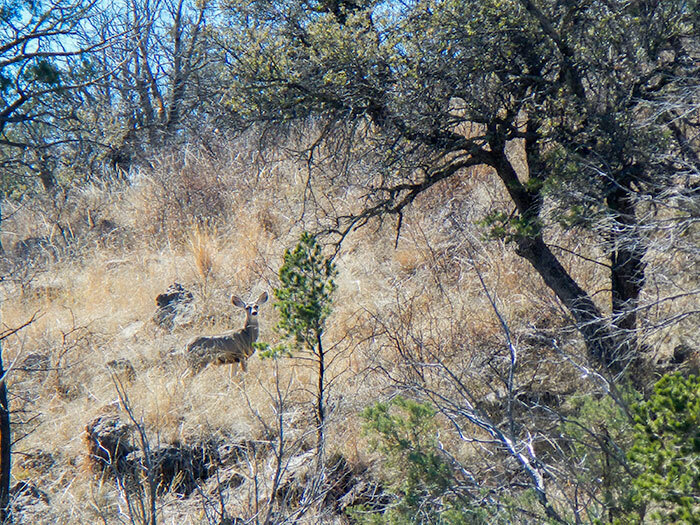 Most people that pass through the Davis Mountains don’t even know this little gem exists, since it sits at one of the many roadside parks and there isn’t a sign on the road identifying it. 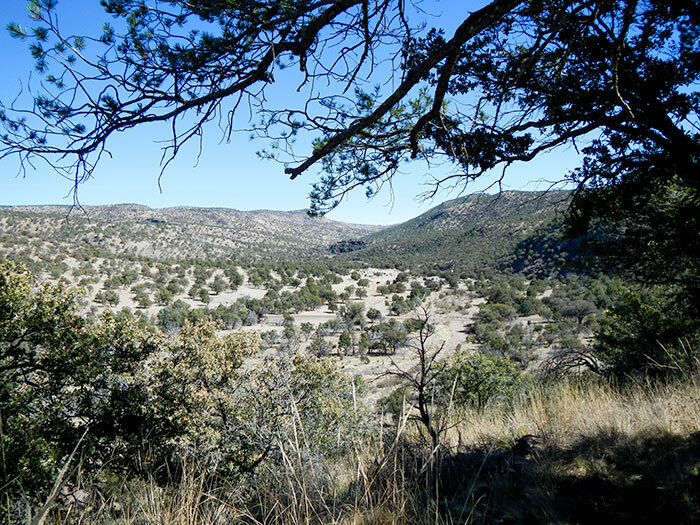 You can find the trail by driving approximately 24 miles Northwest from Fort Davis on highway 118. The trail begins in the Lawrence E. Wood picnic area (30.707034, -104.104078), which will be on the left side of the road as you’re heading North. The elevation graph below shows the elevations if you take a right where the trail splits. The trail begins on the far East side of the roadside park (30.707034, -104.104078). From there you’ll follow alongside Madera Creek for less than a quarter of a mile, where there’ll be a crossing. When crossing the creek, keep an eye out for the rock cairns, so that you’ll be able to see where the trail picks back up. 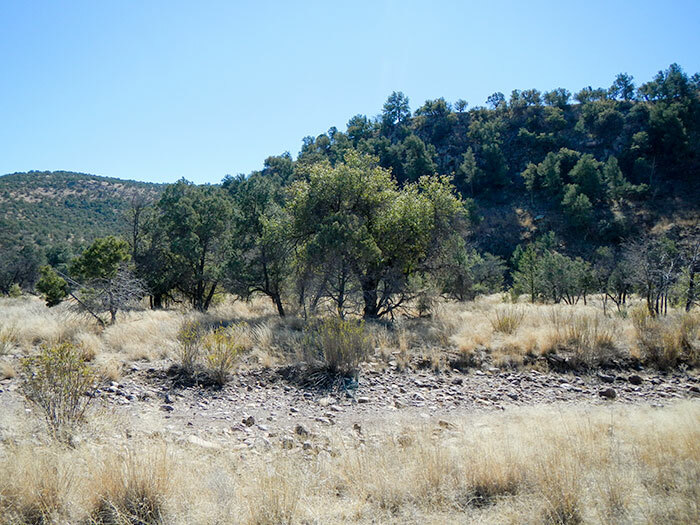 Once across the creek, you’ll start a gradual ascent up the small mountain that was to your left when you began the trail. After a short climb, the trail will split (30.704377, -104.101740), with one path taking you to the top of the mountain, and the other sending you back down near the creek. We generally like to do our ascents in the early part of our hikes, so we took a right here. After taking a right to head up the mountain, you’ll find a park bench to sit on and take in the view. 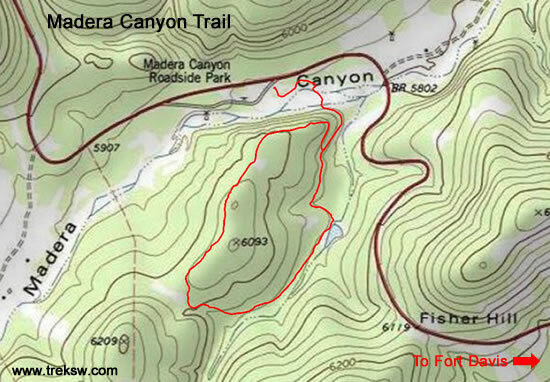 From here, the trail will wind to the opposite side of the mountain where it will intersect with an upstream portion of Madera Creek. It will start descending back into the canyon, around the opposite side of the mountain. Once back down in the canyon, you’ll see a small pond with a man-made wall on one side. During rainy seasons, if you’re lucky, the pond will overflow the wall and trickle down the creek. This is a great spot to sit and relax with the sound of running water in the background. I’ve been on this trail twice now, and have seen deer on both trips. This small body of water likely attracts animals from miles around. From here, be careful and don’t get off of the trail. You’ll have the tendency to want to continue past the pond and follow the fence-line down. Don’t do that. The trail actually takes a hard left just past the pond (30.7014543, -104.1012643) and goes back up the mountain a short way, to where the trail split. Keep an eye out for the trail markers on the trees. Once you get back to where the trail split, its a simple matter of backtracking back to the roadside park. This short trail is a good stop if you’re out sightseeing and want to get in a quick hike to stretch your legs, without having to pay a fee to get into the state park. 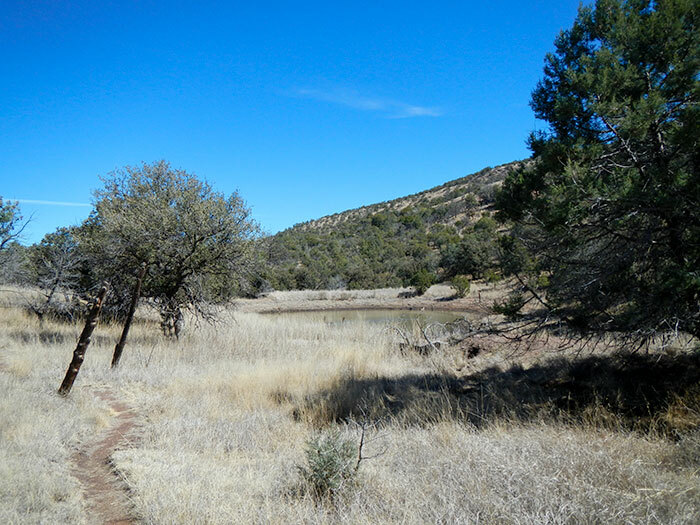 Unfortunately, in the Davis Mountains, there aren’t a lot of hiker friendly areas. Most of the land here is privately owned.